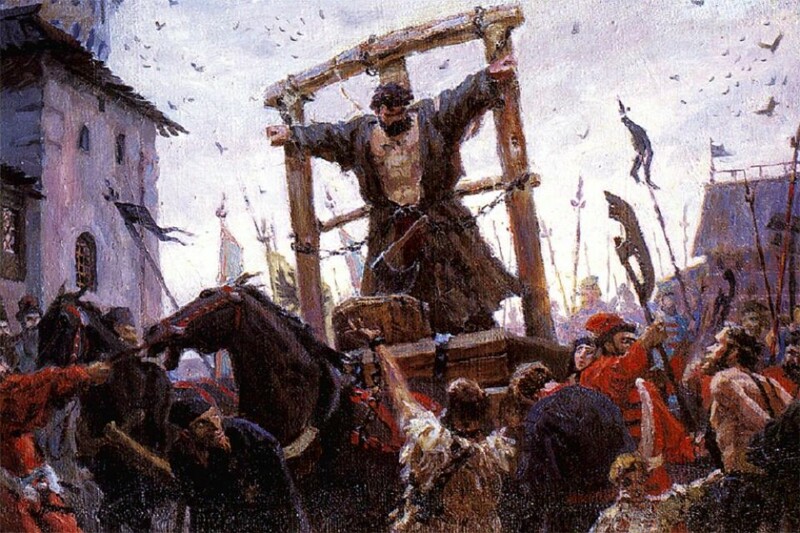 On this date* in 1671, famed rebel Stepan (Stenka) Razin was publicly butchered in Moscow. On that day, following four days of torture, he was led to an executioner’s scaffold in Red Square in the company of his younger brother, Frol. The list of Razin’s crimes and then his sentence were read out to him. 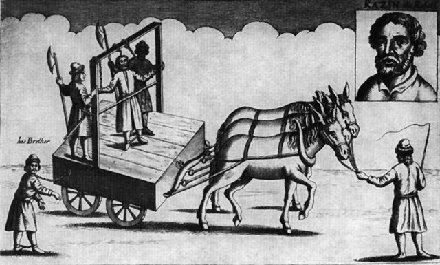 The punishment was to be “an evil death befitting the wicked — by quartering.” According to eyewitness accounts, Razin then crossed himself and submitted to the executioner. Normally, death by quartering requires that the executioner first chop off the right arm of the convicted man at the elbow, then his left leg at the knee, then the left arm at the elbow, then the right leg at the knee, ending the whole gruesome process by decapitation. In the case of Razin, the executioner made only the first two cuts when, for some reason — perhaps for fear of Razin’s power over the assembled multitude — he was told to end it all and chop off the head. To complete the sentence, the executioner then went back and severed the remaining limbs of the already headless Razin. The limbs and the severed head were taken to Bolotnaia ploshchad’ across the Moscow River and displayed on spikes. The body was thrown to the dogs. Frol, who was supposed to be executed in a similar manner, began screaming his willingness to cooperate with the authorities midway through his brother’s execution. He was led back to prison, interrogated further, and executed on 26 May 1676. Stenka Razin’s unpleasant end came with the consolation of a ticket to immortality as Russia’s go-to folklore bandit. In life, Razin led the most renowned internal rising against the Romanovs, lasting from 1667 to 1671. Marshaling the underclasses (literally, the “naked ones”: the Cossacks had class issues) in the semi-lawless southern reaches of the realm, Razin segued smoothly from from a career of brigandage into suzerainty over a quasi-state around the Volga with the help of a sympathetic peasant uprising. 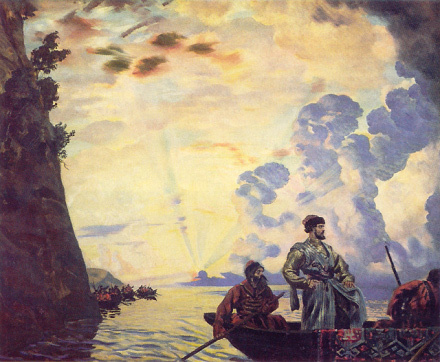 Stepan Razin on the Volga (1918), by Boris Kustodiev. 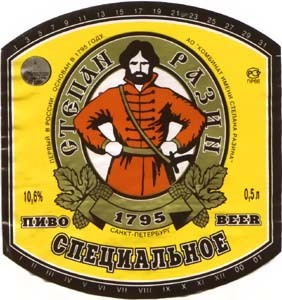 Throw back a frosty glass of Stepan Razin beer, brewed in St. Petersburg since 1795. Razin’s revolt had scope and duration enough to trounce a Persian expedition against him. He bestrode the Volga — sailed the Caspian — raided foreign lands — established a Cossack republic. It was an impressive run while it lasted. But like most peasant revolts, it was ultimately on the receiving end of the trouncing. Captured and hailed to Moscow for his demonstrative end, Razin’s story lives strong in Russian culture and folklore even though his body ended up in bits and pieces. Razin is the subject, for instance, of the first Russian feature film, a 1908 silent. According to the Russian Wikipedia, Razin was even the subject of the first foreign dissertation about a Russian figure. During the late 19th century’s reactionary period, Boris Glazunov put Razin’s capture to symphony. In the Soviet era, poet Yevgeny Yevtushenko wrote about Razin’s execution, and so did Dmitri Shostakovich. Best-recognized and most universally beloved is the folk tune “Ponizovaya Volnitsa”, which celebrates Stenka and the mighty waterway that bore him to posterity, the Volga. * June 6, 1671 per the Julian calendar. It was June 16 in those countries that had already adopted the Gregorian calendar.